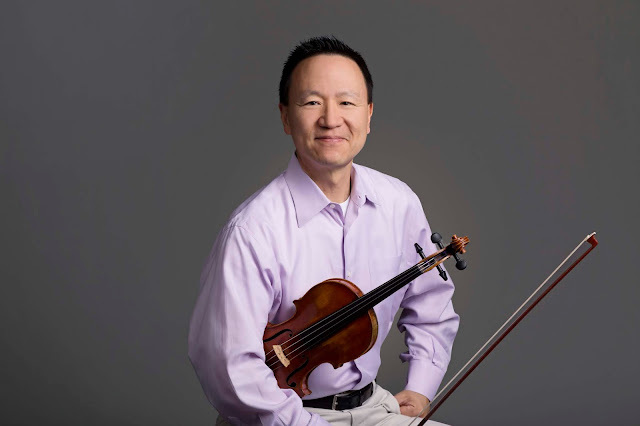 Violinist David Kim was named concertmaster of The Philadelphia Orchestra in 1999. Born in Carbondale, Illinois, he started playing the violin at the age of three, began studies at the age of eight, and received his Bachelor’s and Master’s degrees from the Juilliard School. He has been awarded honorary doctorates from Eastern University, the University of Rhode Island and Dickinson College. His violins of choice are a J.B. Guadagnini from Milan, (circa 1757) and a Michael Angelo Bergonzi from Cremon (circa 1754). Stay Thirsty Magazine was very pleased to visit with David Kim at his home in the Philadelphia suburbs for this Conversation about his life, his art and his advice. He will be appearing with The Philadelphia Orchestra in the Summer of 2018 at the Saratoga Performing Arts Center during the month of August. STAY THIRSTY: What life lessons have you learned from playing the violin? How has that instrument molded you as a musician, a husband and a father? DAVID KIM: When one has a job that is this prominent, everyone is always tossing compliments your way. The hard part is not believing all of the praise. When I go home I am definitely brought back to earth by my wife and two teenage daughters. They are not impressed by anything that I can pull out of my “ego hat.” I love that about my family though – keeping me grounded. STAY THIRSTY: One of the violins you play was made by J.B. Guadagnini, from Milan, around 1757. What does it mean to you to play an instrument that was made over 260 years ago? Does that violin command a special reverence from you? DAVID KIM: The “Guad” is actually owned by The Philadelphia Orchestra and I am given the use of it as long as I am a member of the orchestra. My own instrument is also a mid-1700 violin from Cremona, Italy, made by Michel Angelo Bergonzi. Both violins are incredible works of art, but to be honest, most of the time I don't give the craftsmanship and value a second thought. I am so used to handling such expensive tools of my trade that I'm completely used to carrying them on the subway or stowing them in overhead airplane bins. STAY THIRSTY: You have been the Concertmaster of The Philadelphia Orchestra for almost twenty years. How have you grown during that time both in your leadership role and as a principal musician? DAVID KIM: I think the saying, “less is more” applies to me now – light years beyond how I handled my job when I first started. I used to over-lead, over-talk, over-try to be clever and funny, over-everything. Now, (some of the time), I can see beyond my own foolishness and know that my colleagues are supremely gifted, experienced artists who do not need their concertmaster to try to be all things to all people. STAY THIRSTY: How influential were your parents in choosing your career? Are you replicating the process with your own children? DAVID KIM: My parents, and especially my mother, are the reason I am where I am. My mother was a pianist and put a one-eighth-sized violin in my hands at age three. From that moment forward, it was a rapid ascent to child prodigy status and studies at the Juilliard School of Music. Growing up in Cleveland, my wife had the same kind of intense upbringing – in her case, with a stage father who was pushing her to become a professional golfer. She began at age five and eventually became a nationally-ranked collegiate player at The Ohio State University. Jane almost made the jump to the professional ranks, but finally realized a life as a pro athlete was not the one she wished for. She stopped playing, earned her M.B.A. at Columbia University, then worked in international tax for Price Waterhouse Coopers for many years, supporting me while I tried to become a solo violinist. When our girls were born, many friends asked us which one would be the musician and the other the athlete. As it turns out, neither Jane nor I had the determination to push our entire family down that arduous and sometimes torturous path. Because without ambitious and sacrificial parents, the nearly impossible task of trying to push your kid to the top of the mountain becomes impossible. We are so fortunate, however, that they both are musicians and will always share that language with us as they proceed into adulthood with music as an avocation. STAY THIRSTY: As a violinist, how does performing at the Saratoga Performing Arts Center (SPAC) differ from performing at the Kimmel Center in Philadelphia? Does the orchestra modify its presentation based on the venue? DAVID KIM: Performing at SPAC is one of the most unique experiences one can enjoy as a member of The Philadelphia Orchestra. The beauty of the amphitheater, the grounds, our thousands of fans enjoying the cool evenings on the lawn with wine and cheese, it all comes together at the end of each season for three magical weeks. Top soloists and conductors, Mrs. London's for a croissant and coffee for breakfast, and a Champagne toast with patrons backstage after the concert. These are things I look forward to each August. STAY THIRSTY: How important is exposing young people to classical music and in meeting members of The Philadelphia Orchestra in person? DAVID KIM: It can be everything to a young person. Going to see and hear The Philadelphia Orchestra is a thrill and treat unto itself. But if one can meet, speak to, and recognize an artist onstage, and maybe even call them friend or mentor, the experience can be inspirational to the point of life changing. Orchestra musicians are incredibly accessible and friendly. The personal touch, relationships, that's what it is all about, not just in music, but in life. STAY THIRSTY: Apart from classical music, what genres do you listen to when driving in your car? DAVID KIM: I listen to a little bit of classical and some jazz as well. I'm also flipping all over the dial from CNN to Christian radio to ESPN. STAY THIRSTY: What three pieces of advice do you have for young musicians who aspire to join a major orchestra? DAVID KIM: Start learning the basic orchestral repertoire as early as possible – middle school? Listen to those works over and over and play them in your lessons as often as possible. Seek out summer festivals where you can learn the language of symphonic music-making and learn the art of taking an orchestra audition. The competition is so tough out there. You just can't start preparing too early. Learn goodwill – both personally and musically. I don't care how great you play your instrument, if you are dogmatic, stubborn or difficult to work with, you're in for a long uphill climb. Be kind, be warm, be flexible.